In layman terms, the numerator in the Gini coefficient is the area between the Lorenz curve of the distribution and the uniform (perfect) distribution line. The denominator is the area under the uniform distribution line. The Gini coefficient is defined as a ratio with values between 0 and 1. The higher the Gini coefficient, the greater the inequality. A value of zero corresponds to perfect income equality (everyone has the same income), while a value of 1 corresponds to perfect income inequality (one person has all the income, and the rest of the population has none). While most developed European nations tend to have Gini coefficients between 0.24 and 0.36, the United States Gini coefficient is above 0.4, indicating that the United States has greater inequality. 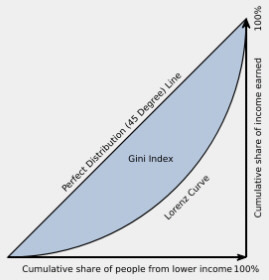 The Gini coefficient is a measure of inequality of a distribution. The Gini coefficient can be used to indicate how a distribution changes over time and if this change shows that equality is increasing or decreasing. Not affected by the shape of the Lorenz curve, only by the ratio of the areas used to compute it. Does not indicate how the inequality is distributed, only the total amount of inequality. The Gini coefficient cannot be used when the values of the variable distributed among the population can take on negative values. No one can have a negative net wealth. The measure will give different results if applied to individuals instead of households. For comparison to be meaningful, the populations must be looked at with consistent definitions. What is Robin Hood Index and how it relates to the Gini coefficient? What is Lorenz curve and how it relates to the Gini coefficient? You can find that on the page with the Lorenz curve.